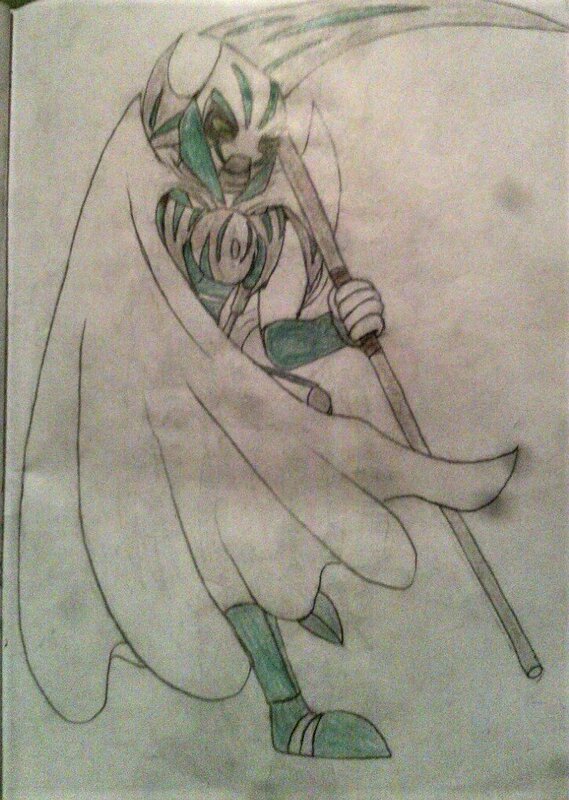 For the The Shadowed One I combined some Umarak in the body, with a bit the original Shadowed One in the mask. With Lariska I just mead her have a metal prosthesis, on her left arm. Her daggers are poisoned. The masks do not have any powers, they are used to keep thear identities a secret. Hordika Dragons are a type of Rahi, who migrate to the island, once a year. They nest on the cliffs in the desert, were they lay their eggs in shallow cliff side holes. Their eggs need dry and hot place to hatch. 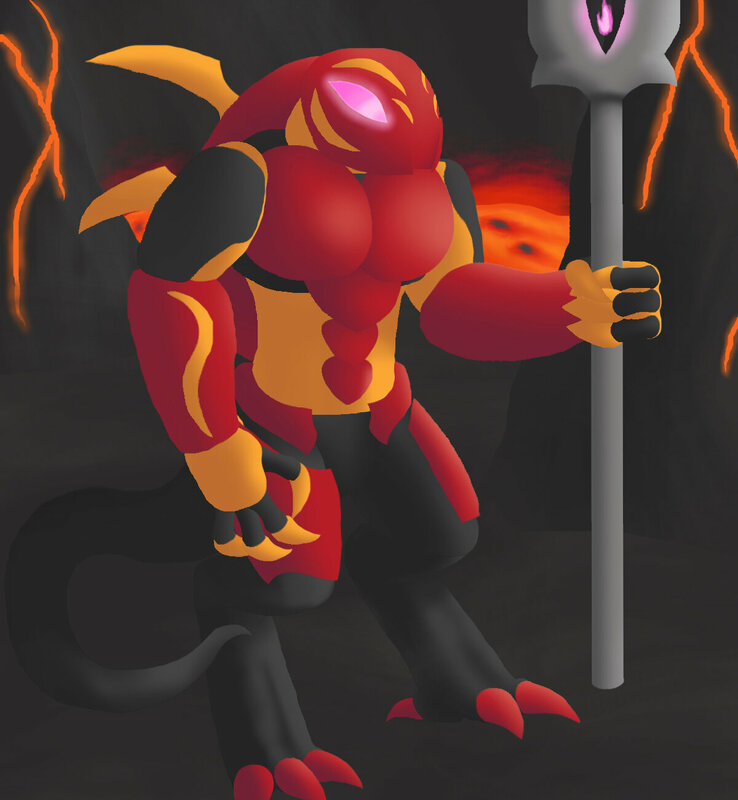 The Hordika Dragons are highly aggressive and territorial. 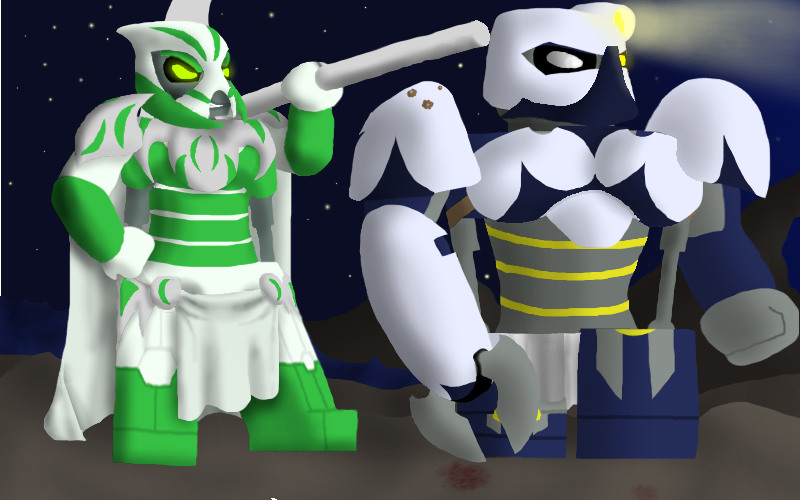 Because of this the Matoran always avoid them. 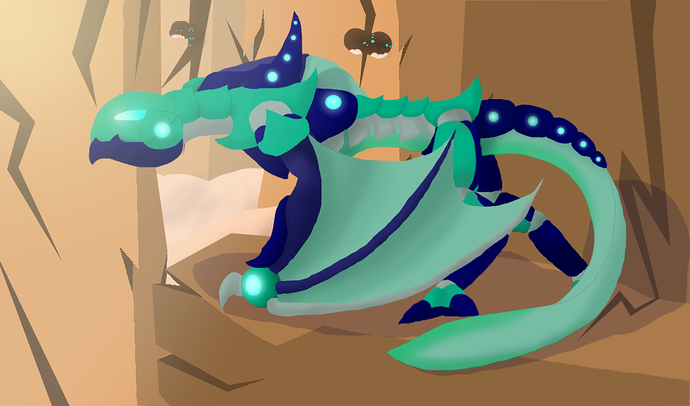 The Hordika Dragons produce electricity, with which they hunt their prey. All though Hordika Dragons are aggressive towards any other living beings, ther hatchlings do imprint on the first being they see. The Shadowed One knew about this and planned accordingly to get some of their eggs. Before The Hordika Dragons came, He and some other of his hunters made a subterranean tunnel to one of these nesting holes and waited for one to come and lay eggs. And when they were not looking he took 4 eggs and got out of there before they notice. After that he just waited for them to hatch. When they did he mead sure to be the only one in the room. And when they immediately imprinted on him. Now they ar his loyal, deadly and obedient pets. I'm thinking of creating designs for the other dark hunters. But for now, it will be all, until I have more time, so stay tuned. Have to say, I love your style. It's very unique, memorable and beautiful. I had some ideas about the Hordika and the venom myself, may write it someday. You should definitely keep up your great work! 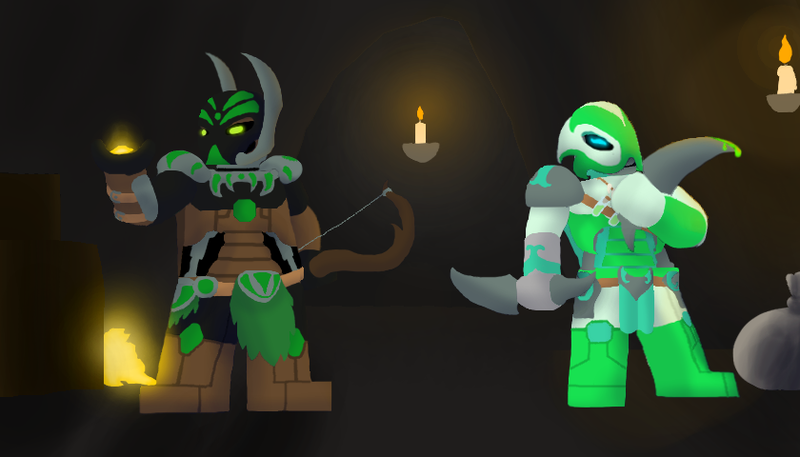 I would love to see the Dark Hunters! This time I tried a different style. Also, I changed his design greatly, in order to better fit with his pet. I made a mask similar to a owl, the front part is sharp as a beak and has large eye holes. 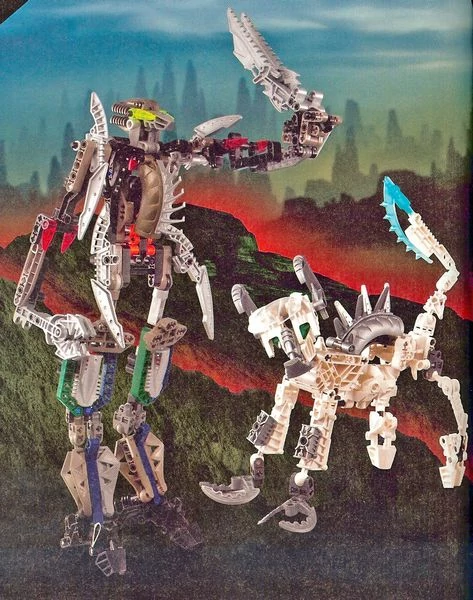 Eyes are red and green because the oreginal had green Bohrok eyes on the head and red Bohrok eyes on his body. 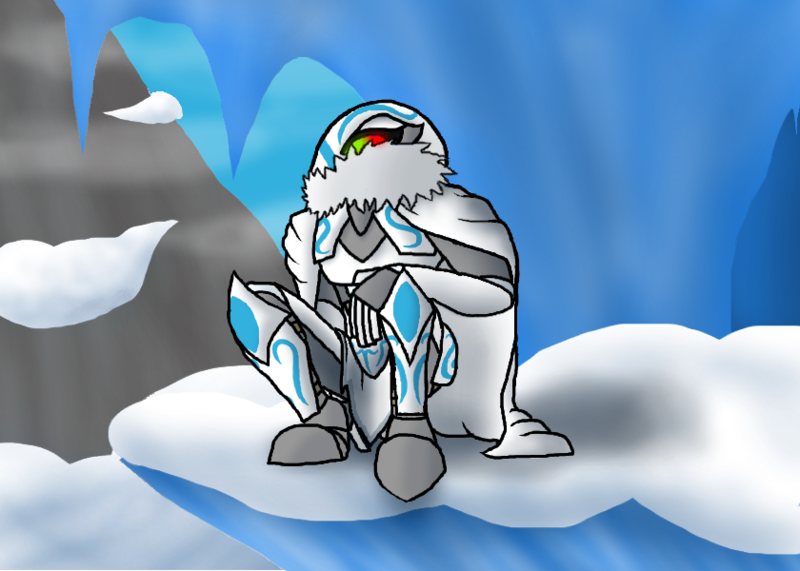 I made him a Ice Matoran because it felt like it fits him. His pet bull is still a work in progress. 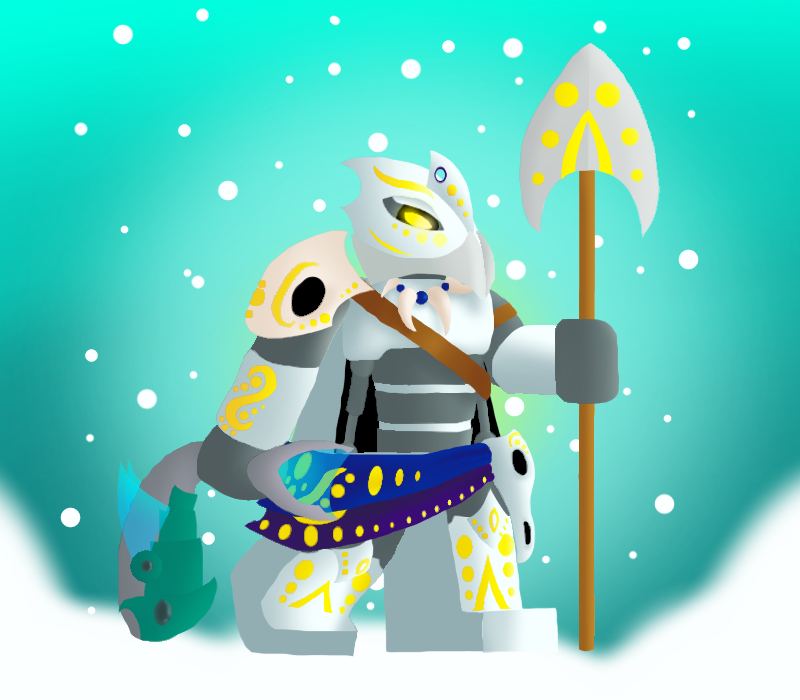 NOTE: I do have designs for ''Amphibax'', "Tyrant", "Conjurer", "Primal", Sentrakh, "Silence", "Ancient", Krekka and Nidhiki. But I only have them drawn by hand. And if you are wondering if Krekkas right arm is a prosthetic, it's not. 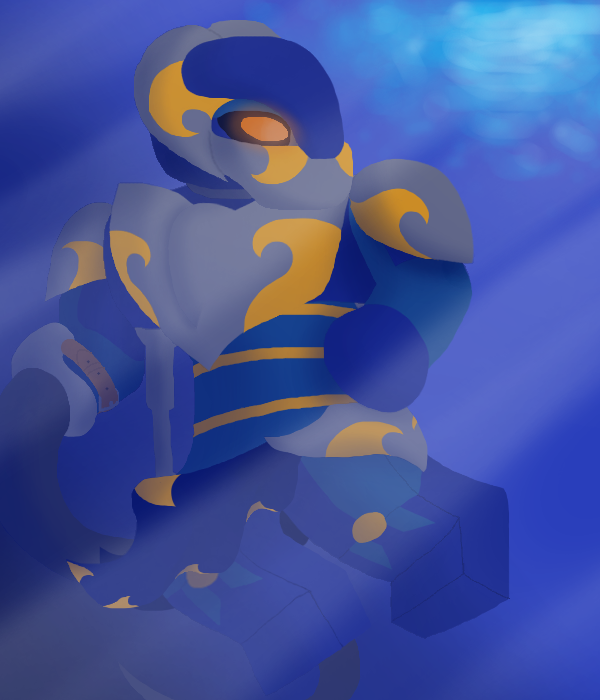 It and his armor are modified claw and armor of a Frigid Ussal Crab, a predatory breed of Ussal Crab. I wish you a lot of joy and good health. Your style here is really cool. It kind of reminds me of the art style in the game spore creatures for the DS especially the hordika dragon. "Ancient" is at a small shrine made for Akida. The clay pot with the sticks in them is a type of air freshener. A sweet smelling liquid is at the bottom of the pot. The pot is blocked by a cork and the sticks pierce it. The sticks absorbs the liquid and give off a sweet smell. If any one wants to know. Thank you. I actually do have spore and spore Galactic Adventures. I find them quite fun. Thank you. But I need more practice drawing in a computer program. 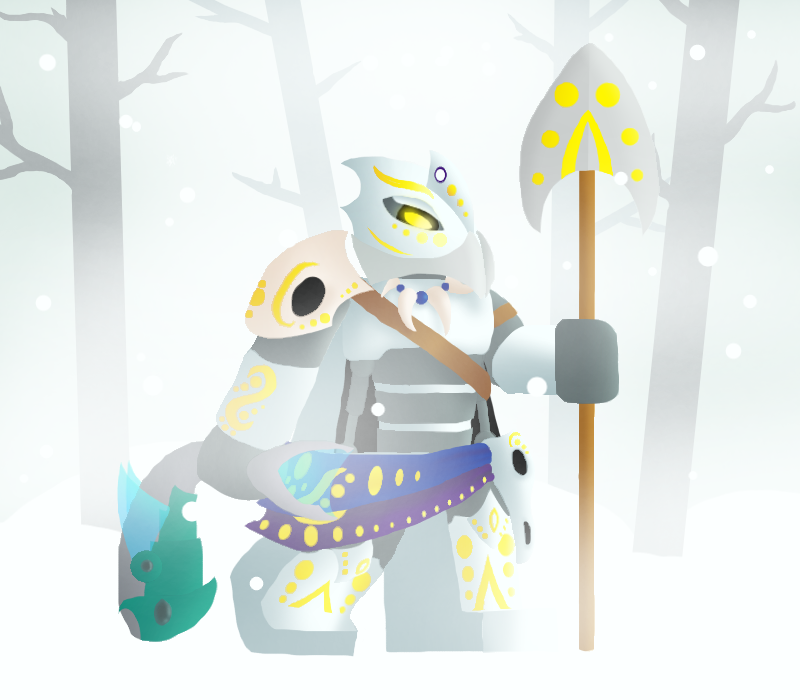 The idea is he is a hunter who loves to hunt and collect trophies. Some of the trophies he wears. A bone necklace he got from a Naho thief, the blue and purple cloths are from some nobleman who were stealing money from the Merchant Kings and the skulls are from rahi he killed in his free time. And if you were wondering about the fish, he was fishing. He uses special smoke that causes hallucinations if inhaled and has a built-in gas mask in his ... well mask. 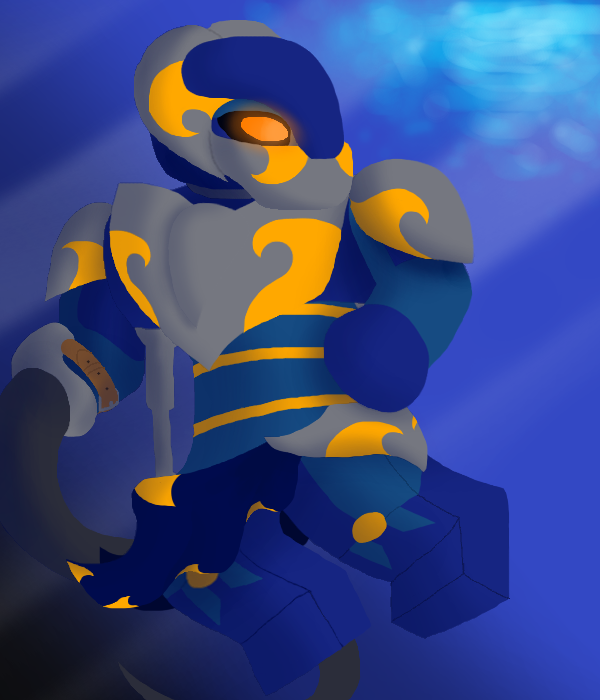 Not sure about this but i made "Tyrant" a Rahkshi, but he has no connection with the Brotherhood of Makuta. 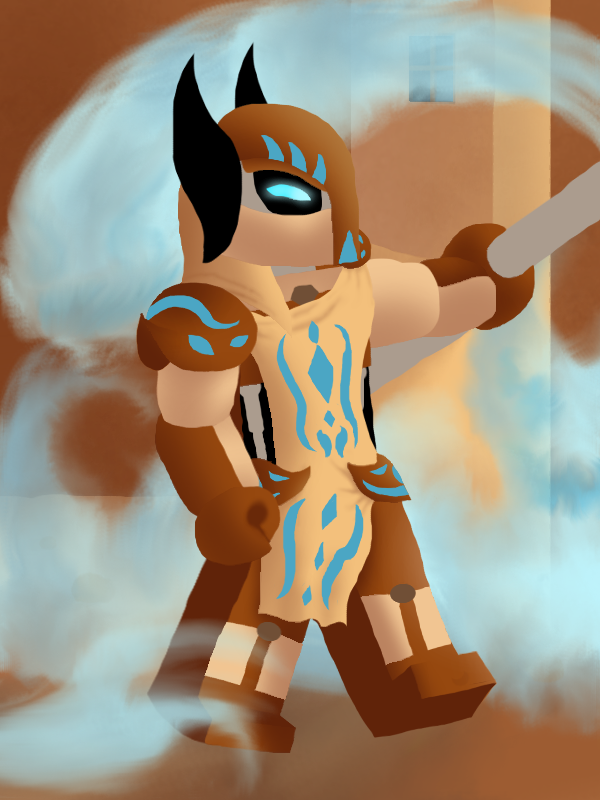 Since TTV made that a matoren can become a Rahkshi by corrupting their element, I thought I would make him in to a Rahkshi. And yes he's the only one of the dark hunters that is a Rahkshi. He was originally a Mangain Nobleman whose greed caused him to lose everything he hadafter he was revealed to be connected to some illegal activities. So he fled from Mangai. He later came to Motara, where he started to dwell in some ... lets call them taboo activities that caused his element to corrupt. With this power he created a black market empire. But he became a little to greedy and he started to steal money from one of the three Merchant Kings. When the Merchant King found out about it he sent The Shadowed One to kill him. The Shadowed One defeated him with the help of "Ancient" and "Eliminator", but didn't kill him, but recruited him as a Dark Hunter. Now he serves as a Dark Hunter on a much smaller salary. He's sent on special night missions for the three Merchant Kings. Also I'm not sure what power to give "Tyrant", since it would be connected to his greed. Help with that would be appreciated. It's interesting to see your Dark Hunters as more detailed sketches than what the mini fig styles tend to allow. If you ever need a decent means of uploading sketches. I have an app on my cellphone called FastScan where you can snap photos with your camera and touch them up as if you were scanning them. I think there are versions of it compatible with most phones if that helps. 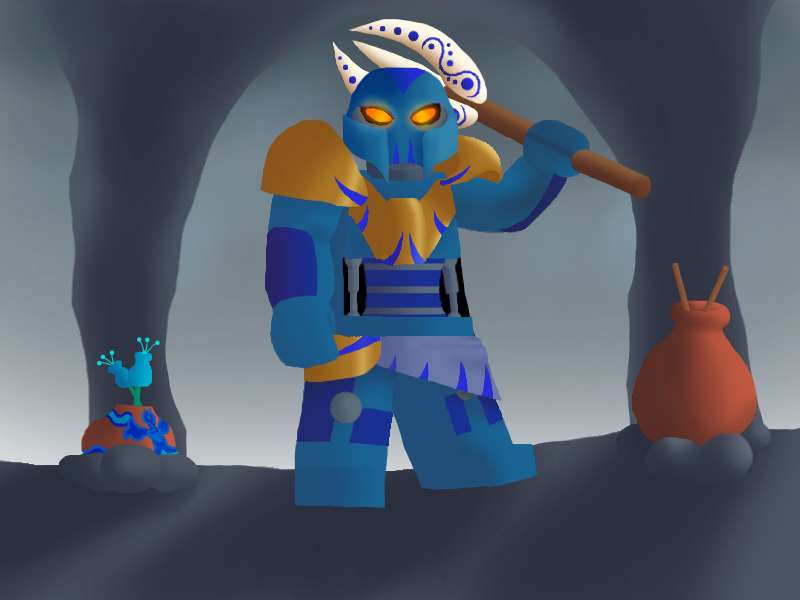 - Became friends with another poor matoran called Vamprah. - Together they used deception and manipulation to make money. Oh well, what do I know about ruining characters.